Bob earned his Master’s degree in Classical Percussion at the University of Calgary and his Bachelor of Music (with distinction) from the University of Alberta. He has received the Alberta Heritage Louise McKinney Scholarship and Alberta Foundation for the Arts Award for Career Development. Bob has been a Resident Artist at the Banff Centre for the Arts, has attended the Music Academy of the West (Santa Barbara), and played in the National Youth Orchestra of Canada. Mr. Fenske is an extra with the Calgary Philharmonic Orchestra and the Red Deer Symphony. 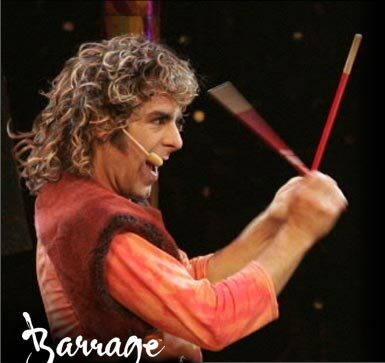 Before joining Barrage, Bob was a sessional instructor at the University of Calgary, where he was the director/conductor of the U of C Percussion ensemble. As a clinician and teacher, he has taught at Mount Royal College, in the Calgary school system, and privately. As well, he has plans to develop a percussion education program. Bob has played percussion for Stage West, the touring show of “Chorus Line,” the Alberta Ballet, and the Calgary Opera. Bob is very excited and honored to be a member of Barrage. Playing percussion in such a unique and diverse band is an incredible learning experience. When you play in a band such as this, it stresses the importance of being a well-rounded musician. It is, therefore, important to listen to many different styles of music. There are so many incredible musicians in the world that one can learn something from any style of music, from any country. The music from Africa, Cuba and Latin America are very influential. Bob is ecstatic to be performing on his new “Mallet Kat,” which is a midi mallet controller made by Alternate Mode. Bob is extremely excited about this new instrument, as it will allow him to play vibes, marimba, steel drums, organ sounds, and anything imaginable, all from one instrument. This is going to be a great addition to the already unique sound of Barrage.